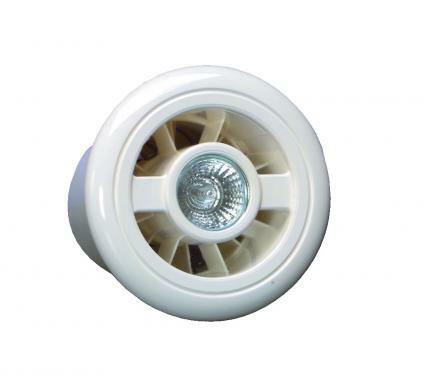 Safety Extra Low Voltage The revolutionary Vent-Axia LuminAir Safety Extra Low Voltage fan and light in a single ceiling mounted fitting. LuminAir has a LED MR16 3W DC 12V lamp to give a pool of soft warm light. The lamp has a long life and is simple to change. Separate LED Driver also included. Provides simultaneous fan and light operation from the bathroom light switch. Switches the fan On with the light. When the light is switched Off, the fan continues to run for an adjustable set period to meet the building regulations for internal bathrooms. Combines a light activated by the bathroom light switch and an Ecotronic Humidity Sensor which will switch the fan ‘On’ whenever the humidity level warrants.